The Moto G7 Play being an unreleased handset (in India), we still do not know its official price. However, in Brazil where the phone is set to first go on sale, the device has been priced at $199 which translates to around INR 14,000. As for the Realme 2 Pro, this is offered in two versions in India; a base 4GB +64GB variant that goes for INR 12,990 and a pricier 6GB +64GB version for INR 14,990. As for the ASUS Zenfone Max Pro M2, this handset is offered in three versions; an entry-level 3GB +32GB version for INR 12,999, a 4GB + 64GB version for INR 14,999 and a 6GB + 64GB version for INR 16,999. The Moto G7 Play is the most affordable of the three Moto G7 series devices that were unveiled recently. It is basically a trimmed down Moto G7 with a lower price tag. The Moto G7 Play gets a decently-sized 5.7-inch IPS LCD screen with a resolution of 1512×720 pixels and a PPI density of 294 PPI. The device uses the Qualcomm Snapdragon 632 SoC and comes with 2GB RAM and 32GB storage on the base version. The phone gets a single 13-megapixel sensor at the rear with f/2.0 aperture with support for full HD video recording. At the front, there is an 8-megapixel selfie camera with f/2.2 aperture. The device is powered by a 3000mAh battery. Connectivity-wise, the Moto G7 Play supports dual SIM cards with 4G VoLTE, Wifi b/g/n, Bluetooth 4.2 and a USB Type-C support. The Realme 2 Pro, on the other hand, gets a large 6.3-inch IPS LCD panel with Full HD+ resolution. The phone uses the Qualcomm Snapdragon 660 SoC that houses an octa-core processor and the Adreno 512 GPU for graphics. The phone comes in two versions; a base 4GB + 64GB version and a pricier 6GB +64GB version. The camera setup on the phone includes a 16-megapixel + 2-megapixel unit at the rear and a 16-megapixel front-facing camera. Moving on to the ASUS Zenfone Max Pro M2, this phone gets a 6.26-inch IPS LCD display with a traditional notch at the top. The phone also uses the Qualcomm Snapdragon 660 SoC with the Adreno 512 GPU. The phone is sold in three versions in the country, a 3GB+32GB base version, a 4GB+64GB mid-ranger, and a 6GB+64GB top of the line version. The camera setup on the Zenfone Max Pro M2 includes 12-megapixel + 5-megapixel rear cameras and a 13-megapixel front-facing camera. The phone also packs a 5,000 mAh battery. 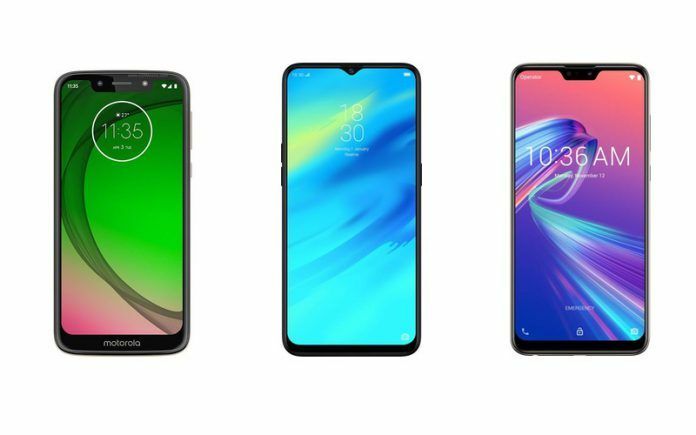 Of these three devices, the Moto G7 clearly falls short of the Realme 2 Pro and the Zenfone Max Pro M2 as far as the specs go. However, we still do not know the price at which the Moto G7 Play would go on sale in India, and for the same reason, we will still give the Moto the benefit of the doubt. Both the Realme 2 Pro and the ASUS Zenfone Max Pro M2 are almost on par as far as the specs go and in our opinion, you will not go wrong with either of them. Personally, though, I will go with the Zenfone since I am not really a big fan of Realme’s ColorOS. Having spent the better part of the last decade writing about technology, Rahul is among the most experienced tech journalists in India. His writing career began back to 2006 when he started off as a member of the Microsoft PYPC (Protect Your PC) team. At Microsoft, most of his time was spent on creating and updating Microsoft’s Knowledge Base articles. In 2008, thanks to his proclivity for consumer technology, he joined Techtree, then India’s most popular consumer tech website. In his decade-long career, Rahul has contributed to several Indian and International publications including GQ Magazine, Onlygizmos, iPhoneHacks, and The Inquisitr.